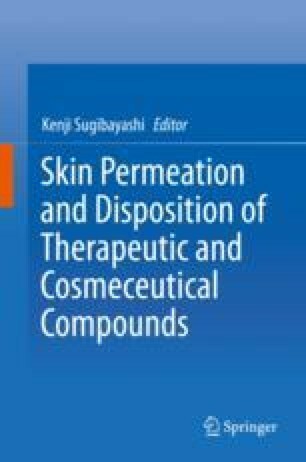 The first step of skin permeation of drugs is the distribution of drugs to the skin surface, the so-called “partition.” After that, partition and diffusion of drugs will be repeated via the stratum corneum, viable epidermis, and dermis. Consequently, the drug reaches the capillary system in subcutaneous tissue on its way toward the systemic circulation. The ratio of drug concentration between administrated vehicle and skin is defined as the “partition coefficient.” In transdermal drug delivery, increasing the partition coefficient is very important in order to increase in the amount of delivered drugs into the systemic circulation.